Black & White Multifunction systems provide a wide range of document processing options all in one device. Print, copy, fax, and scanning functions can all be taken care of by the same system which eliminated the need for multiple machines. A variety of features is offered so it’s important to compare different devices to find the one that meets your needs. We are happy to make a recommendation to you based on our years of experience. 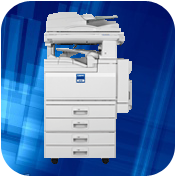 Models range from smaller units that have copying and faxing functions to full-featured systems with high-volume duplication, printing and high definition image scanning capabilities.